Published: July 11, 2014 at 07:22 p.m. Updated: July 12, 2014 at 05:56 p.m.
A view of the newly extended goal posts at M&T Bank Stadium. Only the sharpest eyes will be able to notice the subtle difference to NFL fields this season. 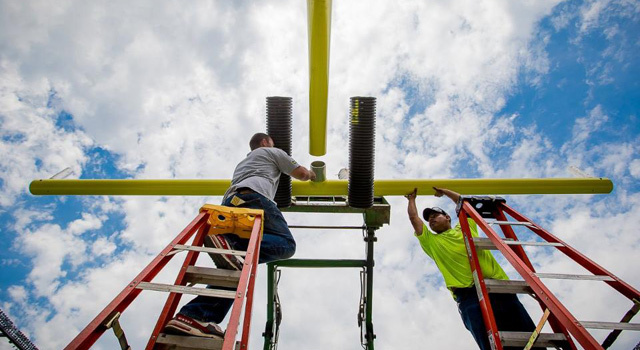 The uprights of all goal posts will be five feet higher, thanks to a new rule passed during the offseason. Proposed by the Patriots, the "Tucker Rule" -- named in honor of Baltimore Ravens kicker Justin Tucker -- hopes to eliminate the type of controversy we saw on a 27-yard Tucker field-goal attempt that sailed over an upright and was ruled good to beat New England in 2012's Week 3 bout. The Ravens' official website was on hand when the new uprights were installed at M&T Bank Stadium this week. The Ravens were forced to buy entirely new goal posts rather than simply add five-foot additions because of wind load. Ravens head groundskeeper Don Follett said the new uprights were tested in winds of more than 100 miles per hour. The whole process is financially exorbitant. 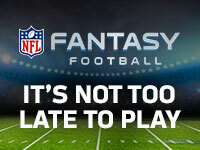 The New York Times reported that a set of new posts will run teams and stadium operators $10,000 and up. Teams must also install the new posts at their practice facilities. Things get even more expensive if teams are forced to replace the foundations that fasten the goal posts into the ground. Thanks, Belichick. The Ravens' website -- I'm telling you, they were all over this story -- additionally offered up a slide show presentation of the installation process. Check it out for yourself, then wow friends at the next wine and cheese soirée with your bottomless knowledge of pro football minutiae. The latest "Around The League Podcast" makes sense of the Andre Johnson situation and pitches ways to fix the "Top 100."